Enigmatic color scheme helps identify orientation in the air. 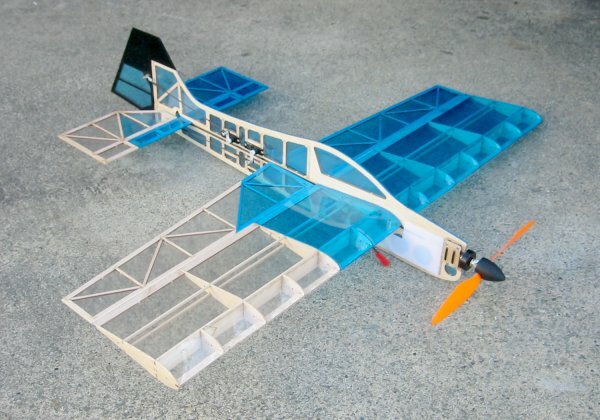 I bought this on a whim because (a) it threatened to fly at about five ounces and (b) I needed a bit more balsa building experience before tackling the Stevens Dystraction, supposedly my balsa Magnum Opus. But now I have my doubts. 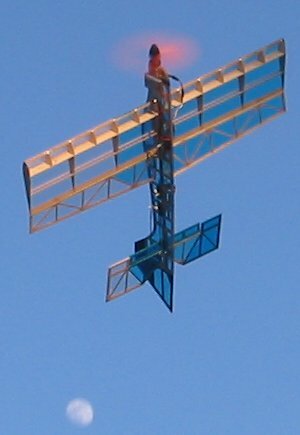 Randy Roman of Model Airplane Engineering named it "Nemesis" probably to sound tough and mean. It's a pussycat. The weight was an issue because I'm curious about planes with very light wing loading: "floaters." They seem to fly gracefully and with very precise control. So I wanted to try one. Plus it looked like an easy build. Wrong. The tail feathers, ailerons and fuse are a cinch, but the wing is very tricky to get right because it's skewered by a carbon rod that also reinforces the two-part fuse. Working around that rod is a major pain. Part fit was good. Layout not so good; the "official" plan calls for some Rube Goldberg routing of the rudder control rod that's completely unnecessary, but I had to rebuild the rudder to do it right. But then there's the flying. Everything's axial and very well balanced. At under 4oz/sqft it's a real floater all right, precise as you could possibly ask for. Graceful and sharp when you want it with oodles of control authority. It's not going to be easy for another small plane to have this kind of performance. Great tight loops. A little floppy on outsiders but extremely round if they're not too tight. Hover is not easy, but very controllable. Great snap and torque maneuvers. Solid in the knife. It specs out at 27" wingspan and a little less in length. It's fairly short coupled, which makes for tighter maneuvers. 5.4-5.9 oz depending on battery (various 2-cell LiPos). With 200 squinches, you do the math. 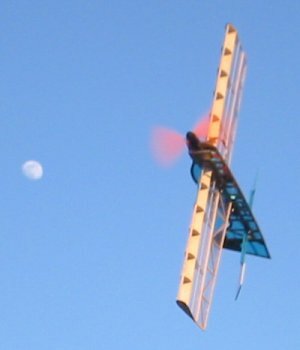 Power is a custom 20-turn Lensrc CDROM motor with an 8043 GWS prop. Three GWS pico servos, GWS Pico receiver and Castle Phonix 10 ESC.